​Wolves host Arsenal on Wednesday evening at Molineux in what could be a pivotal Premier League clash in each team’s season. For the home side, a win would keep them in contention in the battle for seventh place, with Nuno Espirito Santo’s men one of four teams vying to finish as the best of the rest and earn the reward of European football next term. Arsenal came unstuck at home to Crystal Palace on Sunday, failing to capitalise on Tottenham and Manchester United dropping points in the race for the top four, leaving Unai Emery’s men with a lot of work to do from their remaining four matches if they want to seal a Champions League spot. Check out 90min’s breakdown of the ​midweek tie below. Wolves have a luxury which many teams would be jealous of at this point in the season – they have no injuries to any members of the first team squad. This is quite remarkable seeing as they endured a long cup run and find themselves in a dog fight in the league table. A week of warm weather training in Spain prior to Saturday’s draw with Brighton was used for mental and physical recovery, in preparation for the final month of the season. For Arsenal, notable absentees include Aaron Ramsey after his hamstring injury against Napoli, with both Granit Xhaka and Denis Suarez classed as questionable after neither made the squad to face Crystal Palace on Sunday. Xhaka has a hip injury while Suarez is believed to be suffering from muscle fatigue. Sokratis Papastathopoulos is available for selection after completing his ​two-match suspension. Hector Bellerin and Danny Welbeck remain sidelined. ​Wolves Patricio; Doherty, Bennett, Coady, Boly, Jonny; Gibbs-White, Neves, Moutinho; Jimenez, Jota​. ​Arsenal ​Leno; Maitland-Niles, Sokratis, Koscielny, Monreal, Kolasinac; Xhaka, Torreira, Guendouzi, Ozil; Lacazette, Aubameyang. History doesn’t bode well for Wolves as they haven’t recorded a win against the Gunners since 1979 in all competitions. The sides have met nine times in the Premier League, Arsenal coming out on top on seven times with the spoils being shared on two occasions. The reverse fixture earlier in the season ended 1-1 at the Emirates, a late goal from Henrikh Mkhitaryan salvaging a point for the home side after Ivan Cavaleiro put Wolves ahead in the 13th minute. Wolves almost snatched a dramatic winner when 19-year-old Morgan Gibbs-White struck the bar in added-time. The youngster has been the subject of much praise from his manager and would love to grab his first Premier League goal this time around. Wolves have struggled to pick their heads up since suffering defeat to Watford in the FA Cup semi final, losing on the road to Southampton and failing to see off Brighton in a 0-0 draw on Saturday afternoon. That being said, they are unbeaten at home since January 7, a run of form which has seen them topple the likes of league leaders Liverpool in the FA Cup and crush Manchester United in back to back games. This will come as worrying news for Arsenal fans as their side have only the ninth best away form in the league. Saturday’s loss at home to Crystal Palace yet again highlighted their weakness in defence as starts for Konstantinos Marvropanos and Carl Jenkinson failed to stabilise the ship. The Gunners have three away games left this season, starting with Wednesday evening’s trip to Molineux, and a positive result is vital in order to gain a bit of momentum to set them up for a tough run in with trips to Leicester and Burnley to come. Here’s a look at both teams’ results in their last five matches. Santo will be looking for his side to bounce back following three disappointing results, and a home fixture against an injury hit Arsenal side who are inconsistent on the road could be the perfect setting. Ramsey will be missed for the away team although it will be their rocky defence which could be the deciding factor in this result. Anything but a win will be seen as dropped points for Emery’s men as the race for the top four hangs on a knife edge. ​Oh Shkodran. Just where to begin? Just when you thought the German couldn’t fall any further in the eyes of Arsenal fans, the centre-back proceeded to tell everyone to hold his drink and watch him do worse. It may have been a poor team performance from the Gunners, but in clawing themselves back to 1-1 straight after half-time against Crystal Palace on Sunday afternoon, you sensed the tides had turned. The Emirates was rocking, the players smelled blood, and the three points that they so desperately needed were in sight once again. But in ushering Wilfried Zaha through to score for a nice Easter Sunday gift, Mustafi may have single-handedly cost ​Arsenal​ Champions League football next year in the blink of an eye. With the Red Devils getting humiliated at Everton, here was the opportunity for Unai Emery’s side to pull away from Manchester United in the race for the top four. Instead, the defeat now means everything looks as close as its ever been, and in truth, with three away fixtures still to come, the Gunners are no longer favourites to secure Champions League football next season. After the game, Emery was understandably protective of his player. Pressed on Mustafi’s performances this season, the Spaniard leapt to the German’s defence and hailed him as being ‘consistent’. The ex-PSG boss was undoubtedly keen to deflect criticism away from the centre-back, but you just wonder whether a Jose Mourinho-style public rollicking might have been the wake-up call needed instead. In the modern era, the Gunners have had some of the best ​Premier League defenders in the game; the likes of Tony Adams, Sol Campbell, Kolo Toure, Laurent Koscielny et al. But they’ve had their fair share of the bad too. Igor Stepanovs anyone? Indeed, it was so typically ‘Mustafi’ that a week after producing arguably his best performance in an Arsenal shirt in a hard-fought 1-0 win at Watford, he proceeded to throw it all away with a piece of mindless defending. This was a must win game. 3 points for the taking. Emery’s initial selection was a gamble, but at 1-1, we’re playing really well. Mustafi ruins it. Ruins it like he does always. Ruins my weekend. Ruins top 4. Ruins Leno. Ruins Arsenal. Sell him first thing come summer. What frustrates and infuriates in equal measure about the World Cup winner (yes, that’s right), is the 27-year-old’s tendency to repeat the same mistakes. Einstein’s definition of insanity was trying the same thing and expecting different results, and in the former Valencia man’s case, it’s throwing himself into tackles when there’s absolutely no need for it. It’s reckless at best, and sheer stupidity at worst. There have been countless moments since his arrival from the Mestalla where just basic communication and understanding of his fellow defenders and goalkeeper would have helped him no end. The Zaha calamity on Sunday was eerily similar to his mistake in Southampton’s opening goal at the Emirates last season, when he appeared to just let Charlie Austin ghost in in front of him and steer the ball past Petr Cech at the near post. The likes of Stepanovs, Pascal Cygan and Phillipe Senderos all had their moments, but their defensive troubles were somewhat covered up by the rest of the team. In Mustafi’s case, any mistake gets amplified, with the Gunners simply not of the requisite quality to make up for it. A propensity to volley criticism at his teammates, as he did so at Bernd Leno’s expense at the weekend, makes it even more impossible for fans to forgive him; in a time when Emery needs his players to embrace the responsibility, Mustafi shirks it. Injuries and suspensions have no doubt taken its toll on Emery’s selection plans, but it won’t be a day too soon if Shkodran Mustafi never puts on an Arsenal shirt again. Extreme measures perhaps, but put simply, Gunners fans at this point would rather have a Didier Drogba-scarred Senderos at centre-back ahead of the bundling German. And that just sums it all up. ​Arsenal manager Unai Emery defended Shkodran Mustafi after the Germany international made a huge error which lead to a goal in the 3-2 loss to Crystal Palace on Sunday. The Gunners missed a big opportunity to move up to third in the Premier League, as they fell to a shock 3-2 defeat to the Eagles, and Mustafi bore the brunt of fans’ criticism on social media for his role in the Eagles’ second goal. In a move which will have confused ​Wilfried Zaha as much as anyone inside the stadium on Sunday, Mustafi seemed to forget what he does for a living and allowed Zaha to skip past him and take the ball through on goal, slotting past Bernd Leno to put Palace back in front. However, when asked about his defender’s performance, ​Arsenal boss Emery said as quoted by the​ Daily Express: “Sometimes he can play very well. I prefer to speak about the consistency in the season. “We are, every player, helping, playing with a big performance. Today (Sunday) also when you can defend. Against Benteke and Zaha you can suffer more. It’s safe to say Gunners fans on Twitter do not share Emery’s feelings towards Mustafi, who is often singled out for criticism when things aren’t going so well in north London. Good morning and happy Easter Monday bank holiday to everybody except Shkodran Mustafi. When we sell Mustafi I am going to hire out Finsbury Park and host a massive rave, everyone is welcome, we can celebrate together. One Arsenal fan even compiled​ a thread of Mustafi’s key mistakes this season, citing two senseless fouls in the box against ​Tottenham and ​Crystal Palace (which were duly punished). ​​Much to the despair of Gunners fan, Mustafi is a regular under Emery and has featured 34 times in all competitions this season. However, of the 16 games the German international has missed, Arsenal have lost just two. ​Unai Emery has admitted that he’s pleased with the progress made by Ainsley Maitland-Niles, but has warned the young fullback against resting on his laurels. A product of Arsenal’s famed Hale End Academy, Maitland-Niles made his debut as a 17-year-old back in 2014, but did not begin appearing regularly for the Gunners until last year’s campaign under Arsene Wenger. Despite playing the bulk of his age-grade football at his preferred position of centre midfield, Emery has deployed Maitland-Niles at right back for the majority of the season. Whilst it may not be his chosen role, the youngster has showcased a clear aptitude for the position, with aggressive pressing, raw pace, and seemingly endless reserves of energy becoming hallmarks of his performances. These traits were all on show during Arsenal’s midweek Europa League quarter-final clash against Napoli, where he helped guide his team to a 1-0 victory, as they progressed to a tantalising semi-final bout against Emery’s former side, Valencia. Speaking to the Daily Star after Thursday’s win, Emery discussed the progress made by Maitland-Niles this season, and outlined what he expects from any young player attempting to break into the Arsenal first team. “First you have to know that our level is a very big level and it requires young players to do a lot of work to show us they have the possibility to get in – and then hold one position at Arsenal. ​Despite progressing to the semi-final of the Europa League in impressive fashion, Emery was quick to turn his attention back to Sunday’s Premier League bout against a Crystal Palace side whose league position contradicts their threat. “Palace have a big coach with big experience. They have big players who are in form. Respect to them. “And I think they have had some very good performances away from home. For example, they won at Manchester City. That means further respect to them. Chief amongst these “big players” outlined by Emery, is surely Wilfred Zaha. Palace’s talismanic striker will arrive at The Emirates with perhaps more of a point to prove than usual, after recent links with a move to Arsenal’s north London rivals, as well as PSG. 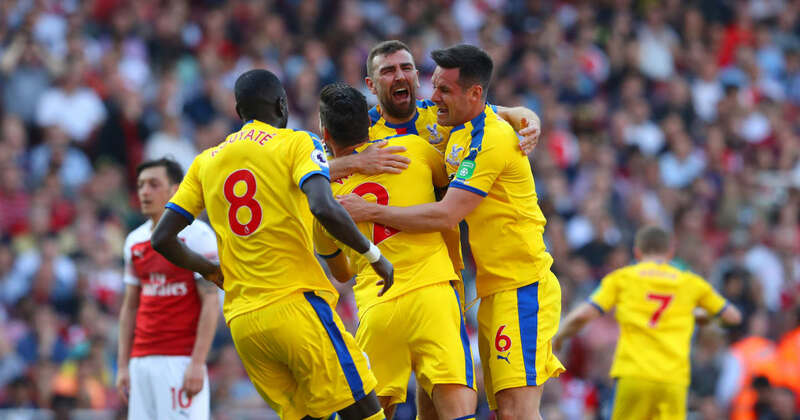 Crystal Palace capitalised on some sloppy defending from Arsenal to punish the Gunners with a stunning 3-2 victory at the Emirates in a thrilling Premier League clash on Sunday. ​Arsenal made their intentions clear with a double substitution at half time, and the Gunners forced the issue early after the interval as Mesut Ozil fired home from close range after latching onto a through ball into the box from substitute Alex Iwobi. The hosts looked to press on in search of another after drawing level, but it was ​Palace who provided the response as Wilfried Zaha punished a mistake from Shkodran Mustafi, forcing his way past the dithering defender before firing the ball past Bernd Leno to restore Palace’s lead. Roy Hodgson’s side punished the Gunners on a set-piece once more as James McArthur flicked home a header from a corner following another scramble at the back from the home side. Pierre-Emerick Aubameyang provided a glimmer of hope with 15 minutes remaining, firing home following some good build-up play from the Gunners, but Palace held on to claim all three points. Just three days on from an intense evening in Naples and with suspensions and injuries having kicked in, Unai Emery was always going to be forced into a significant rotation of his side on Sunday, and that made things difficult for the Gunners. With Sokratis Papastathopoulos suspended, Granit Xhaka and Aaron Ramsey injured and Lucas Torreira only fit enough for the bench, Emery made seven changes to the side which won 1-0 against Napoli in midweek, with their replacements in the side not up to scratch. Konstantinos Mavropanos and Matteo Guendouzi are fine young talents but still have a long way to go in establishing themselves as Premier League stars, as was seen against Palace, whilst Mohamed Elneny and Carl Jenkinson simply do not meet the required standards for Arsenal. The Gunners upped the tempo in the second half, largely owing to Emery’s substitutions and change of shape after the interval, but Arsenal remained vulnerable at the back and were punished for some sloppy defending. STAR MAN – In what was far from a vintage display from Arsenal, Alexandre Lacazette was the player who appeared most likely to make an impact for the home side, though the Frenchman was not helped by a lack of quality service from his teammates. Lacazette showed his desire and commitment once more by chasing back into his own half at times to find the ball, though he was unable to have the desired impact. Le meilleur joueur d’Arsenal est Alexandre Lacazette. With Crystal Palace not under the threat of relegation and essentially playing their season to a close with little on the agenda, their game plan at the Emirates seemed very clear. The Eagles were always going to fancy their chances of overpowering an Arsenal side which were without the suspended Papastathopoulos and the injured Xhaka on set-pieces, and that certainly proved to be the case. Get so nervous in these situations. Game is in our hands and we can really take the other team to the sword, but the growing fear of losing what you have as the game goes on will start to invite pressure. Keep going lads! Benteke headed the opener with a level of ease which Emery would have loathed to see, and Roy Hodgson’s side continued to hit Arsenal every time they dropped their withered guard as the Eagles left the Emirates stunned. STAR MAN – Crystal Palace made life extremely difficult for a struggling Arsenal side on Sunday, and Aaron Wan-Bissaka turned in yet another strong performance for the Eagles at the Emirates. The Gunners typically boast a strong attacking threat through the likes of ​Aubameyang, Iwobi and Sead Kolasinac down the left flank, but Wan-Bissaka utilised his power and energy to strong effect in containing the home side. Wan Bissaka made Iwobi, Kolasinac and every Arsenal player who tried attacking thru his side look like amateurs. Man soooo good, Unai Emery should sign him. ​Arsenal face a tough trip to Molineux to take on Wolves in the Premier League on Wednesday before travelling to the King Power Stadium to face Leicester next Sunday. Meanwhile, Crystal Palace will look to build on their victory when they host Everton at Selhurst Park next Saturday.